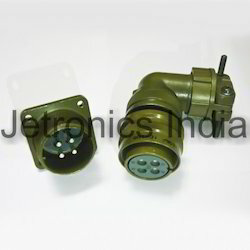 Providing you the best range of military connector and circular military connectors with effective & timely delivery. We offer Military Connector. Typical Circular connectors have pins mounted into an insert within the connectors. Disposed around the insert is a movable coupling nut which can be twisted to allow the coupling nut to engage the mating receptacle connector. Different insert layouts as per MIL STD1651A and different contact sizes allow carrying of current upto 150 amps. The standard MIL C 5015 insert layouts permit mixing of power and signal contacts. We offer Circular Military Connectors. Typical Circular connectors have pins mounted into an insert within the connectors. Disposed around the insert is a movable coupling nut which can be twisted to allow the coupling nut to engage the mating receptacle connector. Different insert layouts as per MIL STD1651A and different contact sizes allow carrying of current upto 150 amps. The standard MIL C 5015 insert layouts permit mixing of power and signal contacts. Looking for Military Connectors ?